The Infographics Prize is for a single poster or print in any size up to A1. The artwork should be submitted as a PDF file. The Interactive Data Prize is for a resource that can be viewed though a standard web-browser. The submission should either be a URL for a website through which the entry can be viewed or a virus-free zipped folder that can be viewed, through a web-browser running on a local machine. Submissions should specify which browser is to be used and should run in both Windows and Mac OS. All submissions must be led by an individual employed by an organisation that is a member of the UKIACR. You don’t need to work on cancer, but must use cancer data, much of which is publicly available, that has been collected by one or more of the members; other team members can be drawn from any organisation. Closing date 15th May 2018. 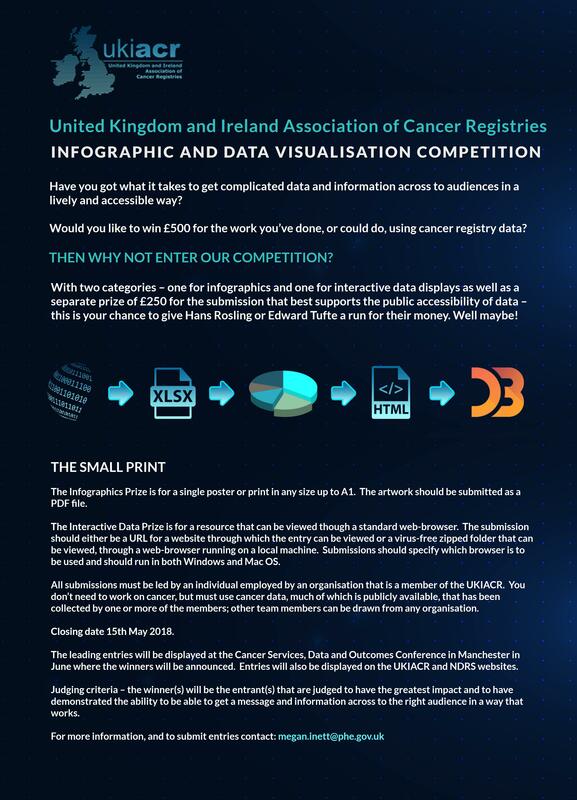 The leading entries will be displayed at the Cancer Services, Data and Outcomes Conference in Manchester in June where the winners will be announced. Entries will also be displayed on the UKIACR and NDRS websites. Judging criteria – the winner(s) will be the entrant(s) that are judged to have the greatest impact and to have demonstrated the ability to be able to get a message and information across to the right audience in a way that works.